In a city full of hurried people, only young Will notices the bird lying hurt on the ground. With the help of his sympathetic mother, he gently wraps the injured bird and takes it home. In classic Bob Graham style, the beauty is in the details: the careful ministrations with an eyedropper, the bedroom filled with animal memorabilia, the saving of the single feather as a good-luck charm for the bird's return to the sky. Wistful and uplifting, here is a tale of possibility — and of the souls who never doubt its power. Bob Graham is the author-illustrator of many acclaimed books for children. 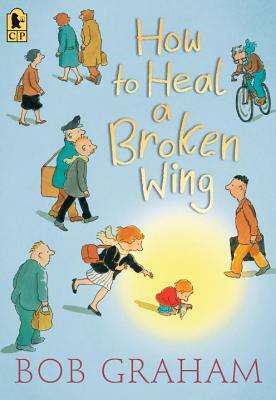 Of HOW TO HEAL A BROKEN WING, he says: "In troubled times, when many of us are losing contact with the natural world, I wanted to show that there is still hope in a coming generation of children who have curiosity and empathy with the world around them, and that care and attention can sometimes fix broken wings." Bob Graham lives in Australia. Quietly, effectively, Graham tells the simple story of a boy who finds a fallen bird and nurses it back to health. The text is minimal...the art has effectively utilized the oversize format, filling it with full-page pictures, vertical and horizontal strips, and cartoon-style boxes in cloudy hues…Because this is such a visual piece…readers, young and old, will return to the story to look more deeply; they won’t be disappointed.